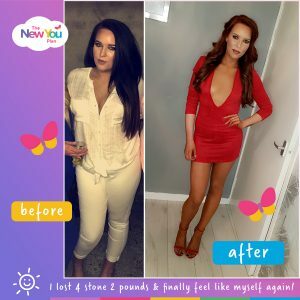 Before finding The New You Plan, Laura felt fat, frumpy and fed up. 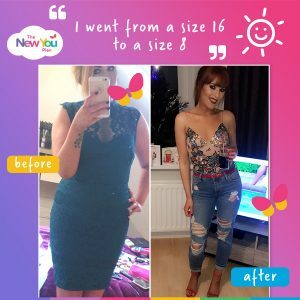 Having previously been a size 8, she dreamed of being that size again. Seeing how well a colleague did on the plan, she decided to take a leap of faith and try it for herself. 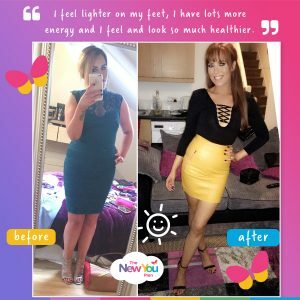 Today, she shares how she lost 4 stone 2 pounds and dropped 4 dress sizes to get her size 8 figure back. Laura, describe how you felt before you started the plan? 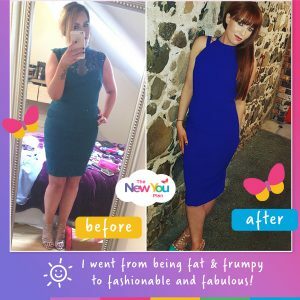 I felt fat, frumpy, paranoid, unhealthy and generally just fed up with myself. I really wasn’t happy about my weight and knew I had to do something about. 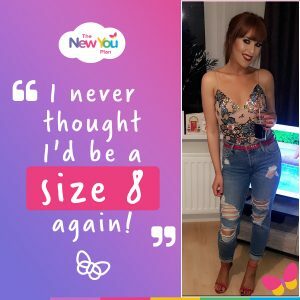 Having previously been a size 8, I just didn’t feel like myself. I was a skinny girl trapped in a fat person’s body. I’ve always loved clothes and felt like nothing looked good on me anymore. It wore me down over the years until I felt like I’d totally lost the person I was. And so, I vowed to do something about it once and for all. A girl in work had lost a lot of weight and looked fabulous. I asked her what her secret was and she told me about The New You Plan. I began researching it online, reading about the success of so many others. 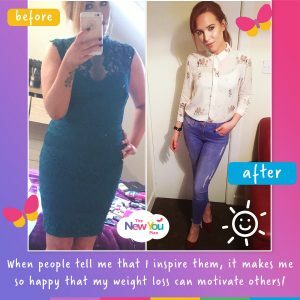 I loved the idea of Secret Slimmers being there to support me, with one community in on it together. And so, I placed my first order to give it a whirl. I couldn’t believe the results. After just a week, I was already feeling more like myself. That big first week loss is the perfect incentive to keep going. 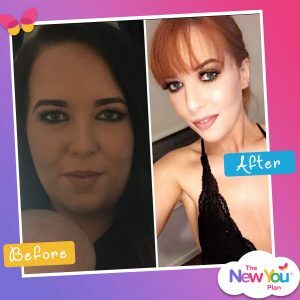 The New You Plan has transformed my life in so many ways. I love that I can now get up in the morning and get dressed stress free. I no longer have to worry about looking fat in a particular skirt or dress. It sounds silly but it saves me so much time in the morning. Not having this stress gets my day off to a a better start, so generally, I’m much happier! It’s such an amazing feeling being able to throw on what I want with no concern whether my belly is sticking out. I feel sooo much lighter on my feet. I have tones more energy and I feel and look so much healthier. My life has definitely changed for the better. The main thing for me was that I wanted to feel like myself again. When losing weight, we should only do it for ourselves. You need to be fully committed to your own journey and be clear on why exactly you are doing it. You have to want to lose weight. That should be your biggest motivator. Fitting into size 8 clothes for the first time since I was 16 is an amazing feeling and something I never thought would happen again. As someone who loves clothes, shopping for a whole new wardrobe has been lovely. I’ve been playing around with my style more and loving it! With losing weight, I have so much more energy and my health is far better. This led to me taking up running and when I was able to run a mile without stopping for the first time ever, it felt incredible. When people tell me that I inspire them to lose weight, it makes me so happy! I love that my weight loss can motivate others to start their own journey. 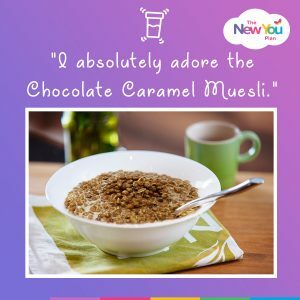 Honestly, I love them all, but in particular I absolutely adore the Chocolate Caramel Muesli. It’s definitely my favourite and I could easily have that everyday, even when I am off plan! I would say stay focussed, think of the reason why you started this journey in the first place and visualise where you could be in a couple of months if you stay on track now. Today’s choices define tomorrow’s outcome! Also your water intake is so important so remember to sip sip sip!! Thank you for your enquiry and I am happy to tell you that The New You Plan is totally suitable for both men and women. 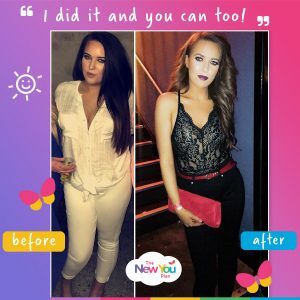 Our meals are available to order through our website and you can find our current fantastic offers here https://www.thenewyouplan.com/Special-Offer-Bundles/. Please contact [email protected] if you have any questions as we will be happy to advise you on the plan and get you started on your weight loss journey. Hi I need to lose a stone, and want to try this, but are the meals filling or do I have to bulk them with vegetables or salads. Thanks for your enquiry, I would love to tell you about how your plan can help change your life 🙂 I am going to break everything down for you. The New You Plan is nutritionally complete and provides you with satisfying meals that give you 100% of your RAD of vitamins and minerals. You can have 2 High Protein Snacks per week (These are Crisps, Biscuits, Wafers etc and are labelled as snacks on our website and within our bundles) . I So want to do this, but I’m not young any more, 62 yrs old 17.4,I’m also on Thyroxine for underactive Thyroid. So metabolism is easily affected. I done a VLCD several yrs ago lost 4stone.Made it to 11stone 3,but it returned with every mouthful of real food I ate. I would of liked to get to 9stone but my stumbling block were the bars. I Would play around wiv them and eat 2in a day! My weight loss would go from 1stone a month to 1-2lb per mth just by my leattle cheating tweaks. So I ‘m aware I need a STRONG guiding hand to keep me focused on the Loss..I also live with 2sabatoeurs…I’ ve become the focus of Thier jokes ie they ‘ll fill the house wiv the smell of baking cakes… etc. and leave all manner of delicious things right next to my shakes! So yes I’ m scared of failing and regaining. However that was then & this is now!! Maybe I ‘m wiser for it. I’ d love to start with a renewed vigour. Crucial I do succeed as my Wieght is causing me too much pain Knees,hips and I ‘ve a vertebrae pressing on a nerve, added Wieght is just unbearable. S o I’ d better get started. PS Love the sound of the Peachy tea.